Comments may be entered for each line item on a purchase order, or they may be associated with the order as a whole. Comments are a means by which you may communicate specific instructions to the vendor regarding the purchase or shipment of items on your order. Comments may be entered on the purchase order as a free‑form entry, or they may be assigned to the order by means of Comment Codes. By using Comment Codes, you will have access to a file of canned comments that have been standardized and approved for inclusion on vendor correspon­dence. 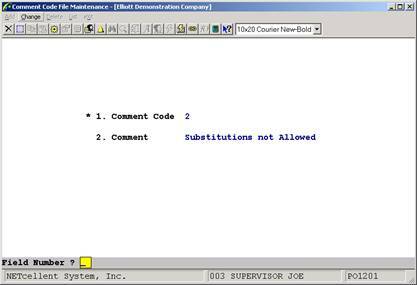 In order applications where a Comment Code is entered, there will be an option available to the operator to display each of the Comment Codes that are on file, one at a time, until the correct comment displays. This feature eliminates the need for the operator to memorize the Comment Codes or search through a listing. Select the desired mode from the Comment Code File menu bar. Enter the data requested on the screen. Enter the code that you wish to have associated with the comment that is entered below. In the change or delete mode, press the F7 key to search for Comment Code. Enter the comment. This comment will display whenever the Comment Code is entered and will also appear on the purchase order form and certain reports whenever a Comment Code has been specified.